The issue of outsourcing has gained significant attention in recent years, in different industries. The different industries have varied factors that influence the scope and nature of outsourcing. China has been one of the most active destinations for outsourced processes and activities. This study focuses on the decision-making models and processes considered by bank managers in developing IT outsourcing strategies, in China. This is based on the increasing use of IT outsourcing in the banking and financial services industry in order to meet customer demands. China was selected because of the challenges it may present for decision makers. Its research objectives are to determine and assess the potential risks for Chinese commercial banks that want to engage in IT outsourcing activities. The study seeks to assess the key decision factors that Chinese commercial banks consider in their IT outsourcing strategies. The methodology employed focuses on the strategic model, as well as the criticality of outsourcing to financial institutions and management attitudes. Analysis of the findings utilizes two constructs to assess the decisions made by commercial banks regarding outsourcing in China. The study proposes to accomplish its objectives using a qualitative study design that utilizes face-to-face interviews to collect data. The data will be coded and assessed using the two constructs of perceived risk and benefit in order to develop a new model. The findings of the study will be highly relevant and significant to medium-sized commercial banks and outsourcing services vendors. The issue of outsourcing has grown significantly in the global economy. Firms are subcontracting an ever-increasing number of activities ranging from marketing, customer care, research and development, as well as manufacturing. As a result, some organizations have developed into virtual manufacturers that own the designs, but do not make any of the products. Vertical disintegration has become a significant aspect in international trade. The production of particular cars in the US includeonly 37% of their value generated within the country while the rest is from different places. When most people refer to the issue of globalization, they think of a manufacturing process that takes place across different geographical locations. The purchase of raw materials and development of standardized products was the initial view of outsourcing, but it has changed significantly with time. Today, it refers to the selection of strategic partners to establish bilateral relationships in order to undertake investments that enable it to fit into the firm’s particular needs. As a result, outsourcing involves more than just purchasing goods and partners have to act with care. These complexities have made outsourcing difficult to measure at an international level (World Trade Organization, 1998). Some scholars on the topic have used trade in intermediate inputs or components as a proxy for what they have termed as global production sharing or intra-product specialization (Rapoport & Yi, 2001). Although the measures used in assessing the growth of international outsourcing are imperfect, they show rapid expansion. The rapid expansion in outsourcing has been in key sectors and industries such As textiles, machinery, electrical equipment, and footwear. Outsourcing in intermediate products and business services are some of the principal areas that have received the most attention in relation to outsourcing (Baldwin, Irani, & Love, 2001). IT outsourcing is one of the key growth areas in today’s business environment. This is because of the increasing significance of ICT to the operation and success of businesses. The size of the global outsourcing industry was estimated by Dataquest to be more than $100 billion in 2001 and growing at the rate of 20% per Annum. A survey of the FTSE index in the London Stock Exchange found a significant correlation between high levels of outsourcing and stock market performance. This highlights the significance of outsourcing and suggests that companies that manage it best are likely to reap the benefits. According to the research company Gartner, the worldwide IT outsourcing market is expected to reach $288 billion by the end of 2013, a 2.8% increase from 2012. Outsourcing simply refers to the contracting of work to outside firms. These firms can be domestic or foreign, and they enable the outsourcer to concentrate on key competencies. It involves business processes that the outsourcing firm feels can be accomplished more effectively by the outside firm as opposed to in-house. It involves different processes that may include manufacturing or the provision of services such as customer care, or marketing. Most companies engage in outsourcing in order to address challenges regarding the availability of skills and resources. They seek efficient and highly qualified outsourcing companies to provide services for their customers or internal operations. Today outsourcing is used as a means of reducing costs and achieving strategic goals. Different models are applied depending on the focus of the organization. The changing waves of outsourcing are developed in response to changes in the business environment. The three main segments of outsourcing applied in today’s world are business process outsourcing, information technology outsourcing, and knowledge process outsourcing. The potential impact of outsourcing can be seen across various business activities and processes. Information Technology outsourcing involves issues such as programming, applications development, and coding. This is mainly geared towards enhancing the ability of organizations to access IT resources that may be difficult to exploit in-house. Outsourcing also involves the performance of a particular business processes and functions such as finance and accounting, back-office operations, processing, and administration, as well as contract functions. This is known as business process outsourcing with organizations seeking service providers to undertake their non-core processes to enhance efficiency. Knowledge process outsourcing (KPO) involves offshoring of domestic business functions to lower cost foreign providers. It helps companies to gain competitive advantages by virtue of the type of activities and processes outsourced. Unlike BPO and ITO, KPO involves high end or knowledge-driven processes. These processes require specialized domain expertise such as financial management, risk assessment, insurance underwriting, clinical trials, legal services, or R&D. KPO is unlike BPO and ITO because it does not involve simple rule-based process expertise and leveraging economies of scale. It focuses on accessing the global talent pool in order to carry out processes that require specialized analytical and technical skills, as well as decision-making and judgment. KPO adds value by providing high quality expertise and superior productivity (Baldia, 2012). IT outsourcing in different industries and organizations is undertaken because of the strategic advantages it offers to them. The central driver of IT outsourcing is cost reduction. It allows companies to access high quality services and processes without spending money in installing computing resources. The outsourcing companies provide services at relatively lower costs compared to what the company may access in-house. It also provides an opportunity to select the lowest cost provider to enhance profitability. IT outsourcing is also used because it allows access to superior skills and expertise. The outsourcing company has access to high quality work force to perform the different tasks effectively. The presence of superior skills from the service provider allows high service quality thus enabling the outsourcing company to deliver the same to its customers. IT outsourcing is a significant aspect in relation to strategy and focus. It allows an organization to select the best-suited service provider to ensure that its services are in line with the needs. Outsourcing allows changes in capacity in line with organizational needs without incurring heavy costs. As a result, it enhances flexibility for the outsourcing company. It plays a strategic role in enhancing the capacity of the outsourcing company to meet its expanding needs for computing (Aalders, 2012). The financial services sector is one of the largest investors in Information Technology. The financial services sector requires significant computing resources in order to perform their activities efficiently and cooperation across geographical locations. The industry has increased utilization of IT resources in response to the financial crisis that affected the global economy (Bartels & Pass, 2000). Increasing market volatility has also made is essential for financial institutions to have effective IT systems for enhanced efficiency. Increasing competition, shrinking demand, globalization, and regulation require banks and other financial institutions to engage in system upgrades and integration. This activity is especially significant for banks involved in mergers and acquisitions because of the need to integrate the operations of the merging institutions. This has highlighted the need for financial institutions to evaluate their operating models, and make significant changes in processes as well as IT. This has prompted many banks to incorporate IT outsourcing as a way of enhancing their operational efficiency (Hirschhein & Lacity, 2000). Financial and banking institutions dominate the global ITO industry. The banking and financial services institutions ITO market is worth US$ 100 billion and is dominant in the industry. Improving profitability and customer experience are the most critical objectives influencing IT investment for the banking industry currently. Some of the key themes in relation to IT outsourcing in the industry involve cloud computing, analytics, and social media. These technologies have a significant role to play in enhancing the operation of financial institutions. The Chinese banking industry has grown significantly with the increasing demand for financial services. This has also increased demand for IT services in the sector enhancing growth of the banking industry IT solution market. The market is expected to grow at an annual compounded rate of 21.7% from 2013 to 2017 (Kearney, 2004). The market will be 9.6% higher than China’s banking industry IT market. The year 2012 was a milestone for the development of the banking sector with the launch of the five-year plan for development and reform of the financial industry. Measures for managing commercial bank capital resulted in the introduction of new capital regulations for the industry (IDC, 2013). The interest rate market also developed significantly in 2012 because of the bidirectional expansion of floating ranges for loan and deposit interest rates. Financial reforms were a significant aspect in political debate, in 2012 laying the foundation for the development of the banking industry. It experienced significant development in 2012 with business and IT functions being highly integrated. The significance of technology in the industry became more apparent and stepped into a new phase of internationalization. Indigenous innovation policy and widespread government investment have helped in enhancing technological advancement, in China. In spite of these advancements, China’s computer network and technology still lags behind compared to the advanced economies. Chinese financial institutions have been falling short of international competitors because of low financial innovativeness. This has reduced the ability of such banks to develop into world standard players. The current situation in the banking industry in China is that the different institutions have realized the significance of technology. They have embarked on strategies for enhancing the utilization of technology in order to increase competitive advantage. The government has also started encouraging collaboration with international players to enhance their global footprint. Initially, financial institutions in China, especially the most sensitive banks, were used to doing everything internally (Daianu, 2005). The “opening up” policy of 1978 enabled Chinese companies to learn from foreign nations and interact in the global market (Hawkins & Mihaljek, 2006). They did not open up to working with foreigners because of their conservative mindset. This mindset is changing, and they are making efforts to enhance performance through the establishment of strong alliances. One such alliance is the collaboration between the Bank of America and China Construction Bank. The two banks sought to get in to collaboration to provide innovative credit card services in China. This collaboration was meant to leverage the financial strength of CCB with BoA’s leading credit card expertise (Bank of America, 2007). This collaboration provided the bank with the capacity to develop solutions that will enable it retain market share while meeting the growing market demand. It is critical for administrators and other decisions makers to understand the benefits of IT outsourcing for their organizations. They also require comprehensive information on the risks and potential pitfalls that their businesses can encounter while implementing IT outsourcing. There are many areas that require consideration including the model to be implemented as well as the best way to ensure the security of critical information. Most of the available literature on IT outsourcing has focused on advanced economies. China and other emerging economies have been assessed as the destinations for outsourced work from the West. There is limited research on the outsourcing drivers and issues for domestic organizations in China. This study will provide critical information on how banks and the financial services sector can benefit from outsourcing IT (Deloitte Research, 2003). It will also shed light on the considerations made by the administrators and other decisions makers before outsourcing their IT functions. This will play a critical role in aiding companies that provide outsourced IT services to know how to attract commercial banks as clients. It will guide them on the aspects that they have to consider. This will enhance their competitiveness and attract high-value clients such as financial institutions or commercial banks. The study is also essential in providing a clear understanding of the political economy and the business atmosphere surrounding the financial services sector. The industry is highly dependent on the government, and there are key political factors that require consideration in strategic decisions (King, 2005). The current study will highlight the political factors that have to be considered by decision makers in the financial services sector. This will aid in understanding the considerations that organizations have to remember in order to benefit from outsourcing in the financial services sector. The background information on the banking industry and developments in relation to IT outsourcing show that significant thought is put into such decisions. The managers have to assess critical information regarding their operations as well as the market in order to benefit from outsourcing. It is clear that financial institutions will benefit from outsourcing y ensuring that they implement key strategies effectively. This highlights the purpose of the current study, which seeks to investigate the impact of different factors that influence decisions towards outsourcing strategies applied in commercial banks, in China. What are the potential risks for Chinese commercial banks that want to engage in IT outsourcing activities? What are the key factors that Chinese commercial banks consider in their IT outsourcing strategies? Which strategic model is most appropriate for outsourcing decision-making in commercial banks? How critical do financial institutions consider outsourcing to be? Does management attitude towards outsourcing influence their perception on the criticality of the strategy? The hypothesis considered for this study is that commercial banks have to consider several key aspects before engaging in IT outsourcing. They have to take a core competency focus and ensure regulatory conformity in their operations. These are the two top factors considered by commercial banks when implementing outsourcing strategies. It is critical to consider that commercial banks also worry about the security of their critical information because of the privacy of customers. As a result, the decision makers in commercial banks have to consider the quality of work, as well as the security offered by the service providers. In outsourcing IT functions, in commercial banks, they focus on different factors that may influence the decision. Commercial banks have priorities such as security, quality of work, strategic aspects that they follow in selecting the model and the service provider. This study follows the model of perceived risks and benefits to assess whether they have a significant influence on the decision by managers. It utilizes a model adopted from (Gewald & Dibbern, 2009) to assess the influence of perceived roadblocks, risks, benefits and criticality in adoption of IT outsourcing for commercial banks. The study utilizes the model suggested from Gewald & Dibber (2009), but modifies it to ensure that the constructs of perceived risk and benefits suit the context of the Chinese financial services sector. This chapter highlights the available literature on the use of IT outsourcing in different industries. Its focus is to show the areas that have been highlighted in previous studies. It will also emphasize strengths as well as weaknesses of the data or available information in order to show gaps. Outsourcing decisions on different organizations are based on different factors such as labor cost. The cost of labor and services provision is the main reason why many organizations outsource their non-core activities. This is because it provides them an opportunity to access high quality services at competitive prices. This occurs because most of the destinations for outsourcing services are low cost emerging economies that have an abundance of skills. They offer IT and other services at significantly low costs compared to other countries. This has played a critical role in making emerging economies significant destinations for outsourced work. The governments in these countries such as China and India have taken the initiative by encouraging their citizens to establish outsourcing companies (Yeats, 2001). Benefits such as tax breaks act as an incentive for the development of these institutions. This has made emerging nations key beneficiaries of outsourcing because of their availability of cheap labor, high skill levels, and an appropriate environment for attracting FDI. Most of the clients for outsourced services are in advanced economies such as Germany, the UK, and US. Labor cost arbitrage due to the differential is the main aspect influencing outsourcing from these economies. The factors that influence the outsourcing of IT and other knowledge-based services also differ significantly from manufacturing. Different industries have varied factors and roadblocks that may influence their uptake of outsourcing activities. The factors influencing outsourcing among companies in the same country or region also vary considerably compared to offshoring across regions. This means organizations in emerging economies have to be effectively apprised with information on the quality of services provided as well as other factors that influence their decisions (Fowler & Jeffs, 1998; Ketler K. & Walstrom, 1993). The main reason why organizations engage in IT outsourcing is that they can derive significant benefits that increase their competitiveness and productivity. Arguments on core competencies, comparative advantage, and transaction cost economics indicate that outsourcing has a cost aspect (Lacity et al, 2009). Managers who are motivated by expectations to generate benefits such as cost reduction, flexibility, and high productivity often see it as a rational decision. Outsourcing provides a significant opportunity to control costs by enhancing flexibility. This is because they can purchase IT capacity as required by their operations. Outsourcing companies have economies of scale and scope because they specialize on particular services or areas (Janko & Koch, 2005). This enables them to provide services at significantly lower costs compared to the cost incurred by their clients in doing the same in-house. Outsourcing provides an opportunity for organizations to improve on their productivity by focusing on core competencies. They get access to a pool of highly qualified technical skills and knowledge for augmenting organizational gaps. The management of a company that outsources its non-core activities gets access to skills that enable the organization to enhance the productivity of its resources. This provides an opportunity for enhancing competitive advantage for the organization. This is because the organization combines in-house skills with those of the outsourcing vendor (Casale, 2001). Outsourcing provides significant benefits to the overall business performance through process improvisation and customer satisfaction. The different studies on the benefits of outsourcing indicate that it is meant to provide tactical, strategic, and business benefits. One of the main benefits is flexibility because it enables the transformation of fixed to variable costs. This presents benefits that enable organizations to focus their activities to the benefit of customers and creation of value (Fisher et al, 2008; Yang & Huang, 2000). Some of the tactical and strategic benefits of outsourcing include efficient management of organizational knowledge. Improvisation of IT, business processes, and innovation provides benefits for organizations that enable them to meet customer demands effectively. Outsourcing is a highly lucrative business process because of the benefits it confers to them. It is critical to consider that the high payoff associated with outsourcing also involves risks that may hinder success. The growing trend of outsourcing involves a growing practice in terms of scope and nature. This situation presents a risk that client organizations face because of their reliance on the vendors for services. The client firm may become over reliant on the vendor of outsourcing for IT or other business needs. This over reliance is negative because it leads to the client organization failing to get the benefits of outsourcing (Duhamel, 2003;). This risk is exacerbated by the inability or unwillingness to provide the level of quality required. This leads to the client organization failing to get the benefits of outsourcing because of quality inconsistency (Marin & Verdie, 2003). Another risk of increasing IT outsourcing is that the client firm may lose core competencies in the field. Organizations outsourcing processes or IT expose themselves to the risk of losing essential internal competencies, cross-functional skills, or innovation capacity. The client organization may also lose control over the processes or the vendor thus reducing its ability to meet customer needs. Engagement in an outsourcing contract also develops problems associated with adverse selection and agency theory. Adverse selection, failure by the vendor or low quality services can increase the complexity of business management. This may defeat the rationale of outsourcing because it makes business difficult for the client. A study by Rouse and Corbitt (2003) showed that management of vendor relationships is one of the main risks associated with outsourcing. Poor management of these relationships can result in reduced realization of the expected benefits and may damage the client organization. Banking and financial services institutions have an additional set of challenges associated with the regulatory environment (Jinnan & Hualiang, 2010; Puga & Trefler, 2002; McLaren, 2002). They have to consider the legal obligation for services and information as well as reputational risks for issues such as lost data or poor service quality. Confidentiality and data integrity issues may arise with IT outsourcing in commercial banks (Gewald & Franke, 2005). These risks may result in many financial institutions shying away from outsourcing their IT because they represent very heavy potential losses. These risks span the wave of outsourcing from ITO to BPO and KPO, but the degree of impact from each factor differs based on the type of outsourcing and the organization. Prior research on the factors influencing outsourcing decisions in different organizations have focused on management attitude towards outsourcing. The perceived risk theory (Peter & Micheel, (1976) has played a critical role in determining such studies. Other decision theories that have been used in assessing decision making regarding IT outsourcing include resources theories and innovation diffusion theories. Cost-risk analysis and Delphi model expert opinion have been applied in prior studies on the decision-making process involving outsourcing activities. Four theoretical constructs based on perceptions have been applied to conceptualize different factors that influence outsourcing decisions. The Jain and Natarajan (2011) study used four theoretical constructs of perceived benefits, perceived roadblocks, perceived risk, and perceived criticality. This section of the paper highlights the strategy applied in addressing the research questions by collecting and analyzing data. The research methodology shows the participants of the study as well as the data collection and analysis plans. The study is designed qualitatively because it relies on the development of a new decision-making model addressing influential factors. The qualitative study relies on in-depth interviews that seek to understand the factors influencing management decisions in commercial banks regarding IT outsourcing. The participants for the study are Chief Information Officers (CIO) from major banks in China. The focus on CIOs is because they are involved in decisions regarding IT, which makes them appropriate for this survey. The study focuses on major banks in China because they have considerable IT operations and they would benefit the most from outsourcing. This strategy aids in assessment of the political economy in China in order to develop decision models that fit into the environment. The data will be collected using open-ended interviews that will be conducted on CIOs in major Chinese banks. The interviews will be conducted face to face in order to provide opportunities for getting additional information. The respondents will be selected using convenience sampling and will rely on getting qualitative data from a small sample of CIOs. The respondents selected will be given an opportunity to expound on the questions asked in order to provide qualitative information on decision-making regarding IT outsourcing. The data collected from the interviews will be coded in order to prepare it for analysis. This will make it possible to assess the responses and analyze them according to the model selected. The responses will be coded to show the categorizations of perceived risk and benefits from the respondents. Anticipated findings from the study will be beneficial to medium-sized commercial banks in China. They can use the results of the research to evaluate their situation before making outsourcing decisions. This will aid them in developing a strategy to avoid undesirable consequences and costs. Development of a decision model for assessing outsourcing strategies will help banks to gain a competitive advantage over their competitors. IT outsourcing vendors can also benefit from the findings of the study. Knowing what the customers need is a fundamental requirement for any business. IT outsourcing vendors will gain information how to attract the proper market segment and develop efficient products. This is especially beneficial for foreign vendors because they will gain an understanding of local preferences and risk endurance. The government and regulators can also benefit from the findings of this research by gaining insight on the deficiency of regulations implemented. Limitations of the study include the use of a considerably small sample. This may reduce the reliability of the data and its generalizability in the population. Another limitation is that institutional information is unreliable. For instance, data from the banking industry indicates that Chinese Banks are performing brilliantly, but the market doubts the accuracy of these figures because of the institutional ineffectiveness of poor information and regulation (The economist, 2011). This study will focus on the decision-making processes and models considered by bank managers in developing IT outsourcing strategies. This is based on the increasing use of IT outsourcing in the banking and financial services industry in order to meet customer demands. The research objectives of this study are to determine and assess the potential risks for Chinese commercial banks that want to engage in IT outsourcing activities. It also seeks to assess the key factors that Chinese commercial banks consider in their IT outsourcing strategies. It also focuses on the strategic model, as well as the criticality of outsourcing to financial institutions and management attitudes. The study utilizes two constructs to assess decision-making models on IT outsourcing in commercial banks, in China. The constructs proposed for the study are perceived benefits and perceived risks of IT outsourcing. The study is accomplished using a qualitative study design that utilizes face-to-face interviews to collect data. The data will be coded and assessed using the two constructs of perceived risk and benefit in order to develop a new model. Aalders, R. (2012). IT Outsourcing: Making it work. White Paper. Fujjitsu. Baldia, S. (2012). Thinking Outside the BPO: Knowledge Process Outsourcing to India. Baldwin, L. P., Irani, Z., & Love, P. E. (2001). Outsourcing information systems: drawing lessons from a banking case study. European Journal of Information Systems, 10 (2), 15–24. Bank of America. (2007). Bank of America and China Construction Bank to Collaborate on Credit Card Business. Bartels, F. L., & Pass, C.L. (2000). International Business: A competitiveness Approach, Singapore: Prentice Hall. Daianu, D. (2005). Who Fears Outsourcing and Offshoring? Southeast European Times, 31 January. Deloitte Research. (2003). The Cusp of A Revolution: How Offshoring Will Transform The Financial Services Industry. London: Deloitte Touche Tohmatsu. Fisher, J., Hirschheim, R. & Jacobs, R. (2008). Understanding the outsourcing learning curve:a longitudinal analysis of a large Australian company. Information Systems Frontiers, 10, 165-78. Fowler A. & Jeffs B. (1998). Examining information systems out-sourcing: A case study from the United Kingdom. Journal of Information Technology. 13(2), 111–126. Gewald, H., & Dibbern, J. (2009). Risk and benefits of business process outsourcing: A study of transaction services in the German banking industry. Information & Management. 46 (4), 249-57. Gewald, H., & Franke, J. (2005). A comparison of the risks in information technology. Journal of Information Technology. 22(3), 121–137. Grossman, G. M. & Helpman, E. (2005). Outsourcing in a global economy. Review of Economic Studies, 72, 135-159. Hawkins, J., & Mihaljek, D. (2006). The banking industry in the emerging market economies: Competition, consolidation and systemic stability- an overview. IDC. (2013). IDC: China Banking Industry IT Solution Market Size to Reach RMB 32 Billion in 2017 at a CAGR of 21.7%. Jain, R. K., & Natarajan, R. (2011). Factors influencing the outsourcing decisions: a study of the banking sector in India. Strategic Outsourcing: An International Journal, 4 (3), 294-322. Janko, W.H., & Koch, S. (2005). Sourcing decisions in the finance sector: Economies of scale and knowledge management. International Finance Symposium, Istanbul, 1-14. Jinnan, L., & Hualiang, J. (2010). Legal Issues on IT Outsourcing of Financial Institutions. China Bulletin, 1-5. Kearney, A. T. (2004). The Changing face of China: China as an Offshore Destination for IT and Business Process Outsourcing, Chicago: A. T. Kearney. King, W.R. (2005). Outsourcing becomes more complex. Information Systems Management, 22 (2), 89-90. Lacity, M.C., et al. (2009). 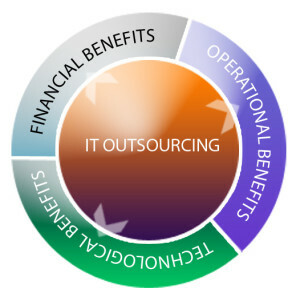 A review of the IT outsourcing literature:insights for practice. Journal of Strategic Information System, 18, 130-46. Marin, D., & Verdie, T. (2003). Globalization and the Empowerment of Talent. Discussion Paper Number 4129. Centre for Economic Policy Research . McLaren, J. (2000). Globalization and vertical structure. American Economic Review, 90, 1239-1254. McLaren, J. (2002). Globalization and Vertical Structure. American Economic Review, 40 (2), 12-22. Peter, J. P., & Michael, J.R. (1976). An investigation of perceived risk at the brand level. Journal of Marketing Research, 13 (2), 184-8. Puga, D., & Trefler, D. (2002). Knowledge Creation and Control in Organizations. Working Paper Number 9121. National Bureau of Economic Research. Rouse, A.C., & Corbitt, B. (2004). IT-supported business process outsourcing (BPO): The good,the bad and the ugly. Proceedings of the Eighth Pacific Asia Conference on Information Systems: Shanghai, China. World Trade Organization. (1998). Annual Reports: 1998. Geneva. World trade Organization. Yang C. & Huang J. B. (2000). A decision model for IS outsourcing. International Journal of Information Management, 20(1), 225–239. Outstanding post, you have pointed out some good IT outsourcing points. I also think that outsourcing is losing momentum and companies are now choosing to keep their IT infrastructure and support within their own countries. Outsourcing IT support to India and China may be a thing of the past.